The range of actions deployed by design professions have seldom entered the debate regarding the relationship between city, rights, and powers. The legitimacy of design actions, though, undergoes the same fragmentation that, in a complementary fashion, questions both the credibility of physical limits in defining what a city is as well as the universal validity of the rights that are spatially defined by such limits. Can the project of architecture transfer a system of general values and rights within a specific action of spatial transformation? Does the project of architecture have the power of dialoguing with the juridical foundation of space? Can the design of space still be the tool through which to reframe narratives, democracy and rights? Is it possible to unhinge the segregated system of rights through the action of the project? When John Searle wrote The construction of social reality in 1995, he recalled an anecdote about a “primitive tribe… building a wall around their territory” to explain how a boundary originates. In the author’s perspective, the spatial form of the wall built is the (material) precondition to a (social) construction of the boundary, intended to be an institutional object in its own right, i.e., an object with autonomous normative power regardless of the presence of the wall built itself, which could go as far as to “crumble”. In this reconstruction, which has been the object of many and differing interpretations (for instance, Farinelli, 2009), we can read a clear, pragmatic position, according to which the ordering of norms originates with the construction of material forms. In opposition to this enunciation, we can locate other hypotheses that conversely position immaterial assumptions – values, ideologies, disciplines – that are crystallized as norms and later translated into spatial forms. An example, in this sense, is the “microphysics of power” as a system of disciplinarization, which is materialized through bodily, procedural, and architectural apparatuses (Foucault, 1977). 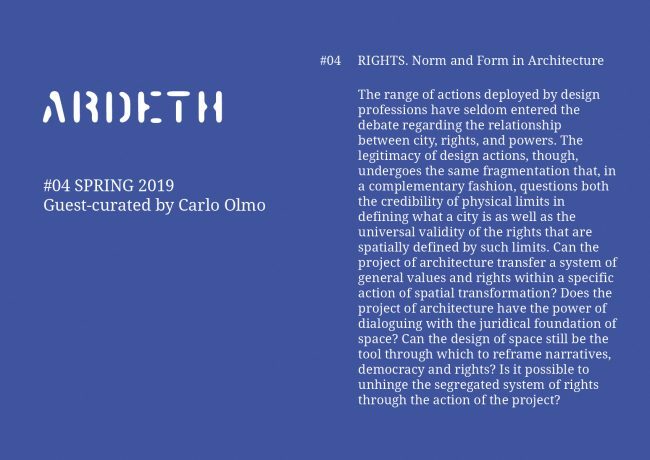 It can be useful to recognize the possible different ways to envision the relationship between the norm and form in order to instrumentally construct a differential axis along which to position the contributions to this fourth issue of Ardeth, which is dedicated to “rights”. In the same taxonomic perspective, a second criterion that could prove useful revolves around the relationship between the space of the present world and the project for a possible future. It can be noted that Searle’s story obliterates the projective dimension and substitutes it with a dichotomy between the presence of the object (the wall) and the norm (the collective intentionality that dictates the need for a boundary). Conversely, it can be imagined that the definition of a right, such as the possibility to cross a boundary, is dependent upon the definition of a project (of norms or of forms) that attempts to modify the existing order. This hypothesis claims at least some autonomy for the dimension of the project in having an impact on the world, as opposed to considering the project as a medium, translating values and powers that are current and interpreted to be real. We, thus, obtain a second dichotomy that puts the concretized power of the mundane space (material as well as social) in dialectic relationship with the virtualized power of the project. The abstract norm vs. the spatial form as well as the social and material space vs. the project are, thus, the two oppositions that we have decided to employ to order the contributions in the present issue. There may have been other criteria and other distinctions, such as the degree of criticality or of pragmatism, that connote each piece. In this case, we would have obtained a three-dimensional space rather than a Cartesian diagram along with difficulties in representation among other things. Rather, we preferred to operate a reduction and attempt a clearer and more falsifiable positioning of the texts, exposing ourselves to possible objections from readers and authors alike in doing so. In this classification game – which is, again, offered as a (debatable) reading guide – the editorial board proposes to arrange a conventional space of differences in order to position all articles in one map across the two orthogonal axes. The vertical axis measures the relationship between the juridical and normative dimension (the institution of rights into norms – “Norm”) and the form of space (“Form”). At the top of the axis is the priority of the norm over the form; here, rights frame the general order, within which the processes of transformation of the space built are carried out (“From Norm to Form”). In this space, we should find both critical positions, according to which the projects and space should yield better to rights as well as to pragmatic positions, interpreting rights as a system of leverages and ties that can make projects effective and spaces efficient. At the bottom of the axis is the opposite paradigm, which is the priority of the spatial form over the norm; in this case, the form of built (or designed) space is to be considered as the preliminary and necessary condition within which to organize or even formulate the normative apparatuses that enforce rights. In critical terms, this leads to considering the form of the space and of the project as a tool for control and coercion that is in need of rethinking for the purpose of liberating rights; in contrast, the pragmatic version of the same position could interpret the form of the space and of the project as the main tool for the negotiation of rules and rights, acting in ever-contingent terms, as there is no guarantee for a priori rights. The horizontal axis, on the other hand, measures the relationship between the concrete space of the form built or of norms (“Space”) and the documental and potential space of the project (“Project”). At the far right, the contributions that find the main generator of cogent effect that allows the modification of space (“From Project to Space”) in the project (of norms or of forms) are positioned. In its critical version, this extreme is translated into full confidence that the project can challenge existing conditions thanks to its own autonomous capacity to produce transformations (normative or morphological). In pragmatic terms, one considers that the project is able to transform reality by activating a chain of effects that impacts uses, values, and significations of space built. At the far left, we find the opposite assumption, according to which the space built and the social practices that activate it are the foundational elements of each project (we could even call them its “plane of immanence”). Paraphrasing Derrida, we could say that in this position, “il n’y a pas de hors-espace”, not even for projects (intending space as a material and social presence); rather, they could be technical and symbolic media whose purpose is to realize the implications of real and actual space (“From Space to Project”). Critically, this could work as a nod to the Lebenswelt against rhetorical mystifications and technocratical opacities. Pragmatically, it works as an augmented investment in analyses, in the explication and measurement of data and reality (encompassing Big Data and the many forms of crowd mapping) before undertaking the project as action. At its highest possible level, the latter could emerge from the former. The combination of the various positions represented in the extremes of the two axes obviously produces four different orientations in the four quadrants according to the following extreme statements: (I) “the project of norms determines the form of space”; (II) “the project of the form determines norms and spatializes them”; (III) “the forms of material and social space steer/define the project of norms”; and (IV) “the normativity of space dictates the form of projects”. Once the coordinates of axes and quadrants are traced, we offer the reader the faculty of judging our positioning of the various contributions within the diagram, as follows. Verena Lenna describes the case of a Community Land Trust in Bruxelles, in which the building and its built space realize the rights of the common good. In this case, the project is derived integrally from existing space and its relationship (encrage) to the neighborhood, and it becomes the way through which the land property revenue is lifted from the ordinary market and given back to the community. The analysis of street sections in Torino allows Manfredo di Robilant and Paolo Mellano to propose a hypothesis in which the normative dimension derives from the form of the space. As a consequence, the project pragmatically measures existing space and sets up a criterion for its pedonalization; this is intended as a norm that fixates the right to the public space of the street. The article by Nicola Marzot claims the prominence of architecture over the project (“… to admit that Architecture, as a path to truth, always precedes the project as ‘document’”) and over the instituted norm (“The fundamental fact — is that such experimentations thus presuppose the suspension, however temporary, of the determinacy of the Plan and its prescriptive character”). 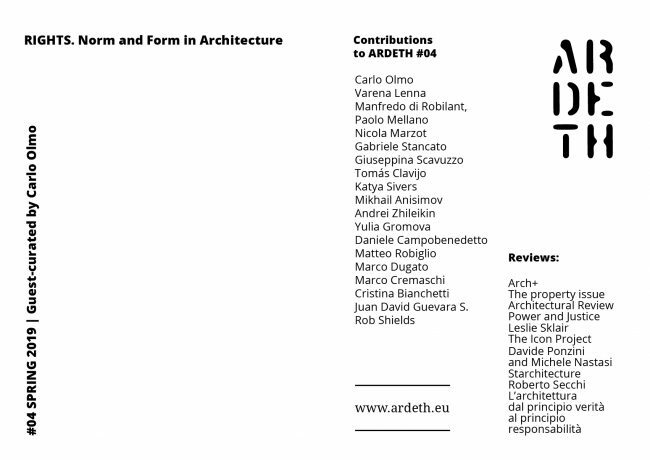 However, with “Architecture”, the author means, first and foremost, its material presence and the “claiming of abandoned and underused spaces”. Autonomy is first a characteristic of Architecture, rather than of the project (and of the “Plan”): “the rehabilitation of architecture and of its historical role depends on the possibility of freeing it from any law that is not the law that architecture itself has set”. Gabriele Stancato deals with the problem of prisons, proposing a scenario in which the project can, in fact, employ the indications given by the United Nations and the European Court of Human Rights. The premise of this position is that the space built determines the conditions for coercion and that, consequently, it is necessary to rethink the way space is built in order to produce different real effects in the name of universal principles and through good norms. The design of prisons is thereby the necessary medium through which to realize new and better conditions, provided it is capable of acting as a translator of good prescriptions, such as the UN Mandela Rules. More boldly than the previous piece but also working on “total institutions”, Giuseppina Scavuzzo’s article proposes a position according to which the project of architecture is the medium through which to produce a “social apparatus”. The programming of psychiatric institutions is inscribed first in the form of the building, and projects of redevelopment should oppose the authoritarian mandates that are materialized in space. In this sense, the project executes the program by translating into physical space, or, rather, it resists already constructed programs in the name of other values. Using the case of the logistical enclave of Khorgos, on the border between Kazakhistan and China along the development of the Belt and Road Initiative, Tomas Clavijo, Katya Sivers, Mikhail Anisimov, Andrei Zhileikin and Yulia Gromova explore the possibility of building a system for the mapping of “technolegal procedures for the exchange of information” that embodies collective action and its spatialization. In this case, “Seiche” attempts to make visible the legislative systems, bureaucratic procedures, material orders of space, and active entities (human and non-human) that form the foundation of conditions within which the governance of this specific territory is carried out. Potentially, the map of procedures that are distributed along a territory in transformation can interfere with the existing order and allow their modifications, or their use according to an explicit strategy that is drawn in space and time. The contribution by Matteo Robiglio and Daniele Campobenedetto deals with the issue of possible superimpositions between public property and common uses within a complex building, such as the Cavallerizza, in the historical center of Torino. In the project that is retraced here, the design of space and of existing distributive systems allows the construction of a multidimensional map of possibilities, which works as a palimpsest for the combination of rights of use and transformative actions (“Design commons through the design of space”). Marco Dugato’s article addresses architects from the perspective of the discipline of law; the project can ask the law to adapt to the circumstances of action, but only in the most general of terms (“architecture rightly suggests (it doesn’t ask), the legislator obeys (and doesn’t impose)”) since, for the law, “individual interests are safeguarded only because they coincide with public interests”. Thus, the project does not produce rules. Rather, it specifies them in its contingency. Marco Cremaschi, writing in an almost specular perspective, employs the case of the eco-neighborhood of Clichy-Batignolles to illustrate the way in which the urban project can act as a “mechanism that traces rights on the ground”, both by separating public from private areas and defining the possibility for each of being developed as well as by triggering a wide range of obligations and permissions. The mechanism for the production of spatialized norms through the project is, therefore, always specific, material, and localized; no planned arrangement can include it ex ante without significant deviations. Describing the case of the Les Grottes neighborhood in Genève and opposing two perspectives, one starkly critical of neoliberalism and the other pragmatic and oriented toward democratic individualism, Cristina Bianchetti draws a map of the relationship between rights and the urban project. In her conclusion, the author takes a stand by delineating the “positive forms” of the project: “In the best cases [the urban project] proceeds from an ethics that is open to possibilities and attentive to protect and strengthen the potentials of places”. In the worst cases, it slides “in pursuit of hyper real micro-histories… and, cascading, into furnishings, materials, lights, vegetal essences, strollers and flower pots”. Essentially, the project protects and reinforces place as well as “accepts tensions” without presuming to resolve them; the transformation of space is a consequence, not the mandate. Finally, Juan David Guevara and Rob Shields offer the case of the spatial classification of the neighborhoods of Bogotà, through which a system of “strata” is established that formally connotes the socioeconomic category of a specific urban neighborhood. The system, originally thought of as a way to overcome deficiencies in public services and to operate a compensative distribution of taxes, has become a tool for social hierarchization. In this case, the project of zones produces the status of the urban space; by establishing a classification of built objects and aggregates, whose variations are monitored and periodically registered, this kind of socioeconomic zoning falls into a vicious circle of symbolic as well as economic diversification. The Ordinary Right Conundrum: Representativeness VS Citizenship? The law is perhaps the first victim of the social and cultural processes that characterize contemporary societies. In this issue, Marco Dugato ironically illustrates the legislative simplification parable that makes evident the crisis in the theorization of complexity, instead of a redemptive end, summoned by philosophers, sociologists, biologists, and engineers. Indeed, reactions to such a crisis involve ordinary rights and, even more, the governance of processes, the core of which is reduced to the institutional engineering of complex social processes, and a simplified idea of innovation, whether intended as technological or competence dissemination. Moving from partially conflicting hypotheses, the essays by Marco Cremaschi and Cristina Bianchetti add to the thesis of the crisis of ordinary rights as inherently linked with spatial theory. The two essays trace a path in which the discussion of rights unveils the inability to rediscover the meaning of public space, risking the production of new social myths, which are, indeed, associated with individual positions – such as Bergson, Maritain, and communitarian ideologies in Europe – simply to avoid neoliberal ideologies. Yet, there is also room for the difficulties in avoiding laziness when proclaiming multicultural statements, which, in part, do not want to see the écart that exists between cultures (Jullien, 2016); on the other hand, they radicalize the betrayal that has made the relationship between rights, individuals, and land too flexible (Supiot, 2015). Considering all of these processes, appeals to any sort of authority expose potential weakness. Even the authority of architectural and spatial projects and designers is under threat, despite the always solid archistar discourse. Yet in another social process authority supports the reduction of substantial Aristotelian matters to the formalization of guarantees that undermine the very concept of law. In medicine, care for those who suffer has been replaced by caring for codes of conduct; similarly, social sciences are also victims of the paradigm of “protocols”. There is no substantial practice of engineers, architects, lawyers, or social scientists. Such professions are increasingly disconnected from factories, building sites, laboratories, and societies, respectively. Their practice, as well as their ethic, is substituted by norms to which to conform. In this volume, the possible outcomes are illustrated by Juan Guevara and Rob Shields in their piece regarding spatial stratification in Bogota, a case of both specific and peculiar overlapping of written and informal rules. Both contributions by Bianchetti and by Guevara and Shields concern actions that almost materialize the multiplicity of rights. Perhaps the main issue today lies in the conflict between procedures (intended also as a general safeguard from potential disputes, regardless of the specificity of the particular issue at hand) and the capacity to orient actions toward a purpose – suffice it to be a transparent purpose if not a virtuous one, as would be most desirable. Prisons and psychiatric institutions, far from being machines, are the most radical expression of a victory of procedures over care today, intended in the way that most attribute to Foucault, as authority over the capacity to suggest solutions, to envision scenarios, and to help citizens (through that projective ability that design holds) to exercise their fundamental right: to choose rather than obey (De Magistris, Scotti, 2018). A possible option is, as Cremaschi does in his essay, to speak of Tracing rights on the ground or, in other words, of the way Paris has attempted a distinction between rights and land (a distinction that far surpasses that between ownership and surface). This position attempts at constructing frameworks that only work throughout their dimension, and forget how even Aristotle considered Hippodamus as legislator, not by chance in Politics, due to the basic relationship between rights and the boundaries within which those rights can guarantee an expression of citizenship. Even before the decision is made, the problematic relationship has to be constructed between the project and rules and between rights and boundaries. A helpful example of this method applies to the notion of the “common good”, a catchphrase that is particularly fashionable today, that links transformative design and rights (Grossi, 2017). The root of the term “common” has been lost. “Common” derives from Latin communis, composed of com– + munis, which mean “together” and “gift”. In Roman Law, and particularly in the Justinian Code, the common good was established on the basis of reciprocity and gratuity of the use of a “gift” (Bruni, 2010). These two principles of reciprocity and the gratuity of some “gifts” directed public policies in the late 19th century, when some goods were conceived as inalienable, such as hygiene, because the right to access them could not be negotiated. Are there common goods today? A few months ago, while elaborating on identity, François Jullien attempted a different definition, based on his extensive work on the concept of “écart” (2016). A major écart concerns the recent Italian bill that regulates how state property can be transferred to local municipalities. A distorted application of theory has resulted in allowing acquisition upon presenting a project of valorization to be implemented within a fixed term. Practically, the law states that a common good can be enjoyed by local citizens instead of being directly sold to private entities; this may sound like good news, but it can happen only if the very nature of the common good is altered, quite likely to exploit some commercial value. The principle of making good use of public resources is commendable, but it may generate paradoxes. This is where Carl Schmitt’s skepticism over the relativism of values might be reconsidered (2008). In the issue, Matteo Robiglio and Daniele Campobenedetto test the reconceptualization of masterplans as tools that produce both knowledge and transformative approaches when applied to the layering of rights throughout centuries and that may become common goods. Yet, both paths open a conflict between valorization and the project; the latter can neither be reduced to added value nor can it turn upside-down the long-standing relationships of power that hold together the discourse of betterment as well as the proof of the utility of the action (Ginzburg, 2014). Dugato continues: “In recommending new rules, the architect should be reminded to think about collective utility and dream of the future”. In the case that this does not happen, no bridge will overcome the gap between an authoritative notion of law and the presumptive dimension of the project. In truth, law and architecture should ally to oppose those homologations that merely reflect the culture of internationalized technocracies, nowhere more so than in large-scale projects managed by engineering companies that make the construction work while the archistars or designers at large are left with the role of producing narratives even more than images (Olmo, 2010). Amidst a culture and society that is founded on conformity to norms and the circulation of copies (Augé, 1997), the space for projecting is annihilated and the built space retains the exclusive value of spectacularizing ideologies. Whether it concerns the right to citizenship or the city of rights, there can be no real conceptualization nor practice of it possible without dealing with complexity and recognizing hierarchies and diversities that exist. Before heading toward this conclusion, it is better to go through another node. The rules of the project can be constructed on the basis of a modern tradition of participation (De Léon, 2017) if we look to an academic world, where the distance between the project and the architecture has been acknowledged and where competence is evaluated based not on the jobsite but, rather, on the basis of the project’s ability to associate contrasting interests (Durbiano, 2018). In truth, a theory of value that only looks at the effect produced by the project raises a plethora of questions that are all but irrelevant. This issue of Ardeth shows that with a certain degree of cruelty, not in the least in the difficulty of updating disciplinary references after Foucault and Lacan’s lessons. To start with, competence risks to be brought back to theories of value in order to safeguard it from being a mirror to aesthetic or critical theories; theories of value, though, conflict with the impossibility of the law to cater to particular interests. 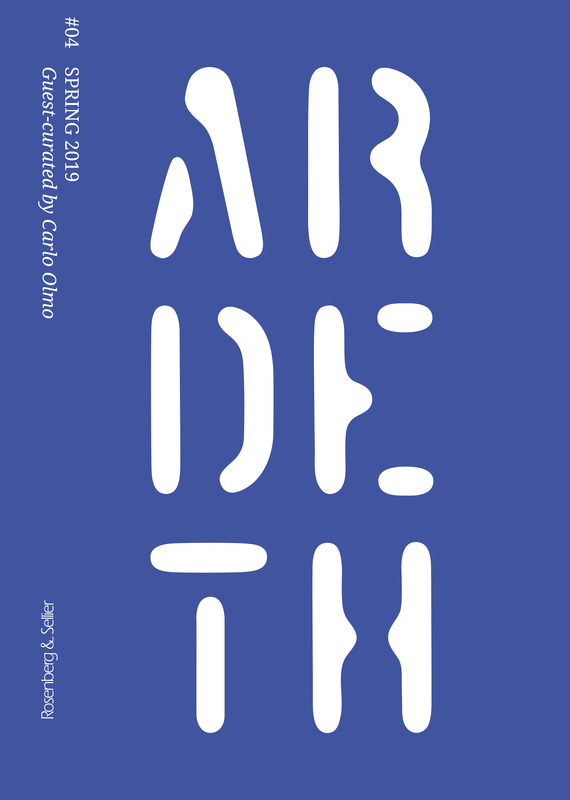 This not only points toward a revival of the tyranny of utility that conditioned the normative season of architectural modernity (suffice it to read any anthology of Das Neue Frankfurt) but also points toward throwing away the baby (representativeness) with the bathwater (the original intention of safeguarding competence), thus, conditioning the ethics of design practice. It is common sense that the political representation of the majority’s will is under threat in present times, and this implicitly questions the legitimization of minorities; more radically, it can be said that all forms of representation of the majority have been vanquished. The crisis was evidenced in the 1970s in Italy, specifically in Torino, when grassroot organizations and sector associations monopolized the representativeness of shared interests with the purpose of getting closer to people in relevant matters. Examples can be found in legal medicine, stemming from the organization of factories, or the design of schools based on Montessori’s theory, to name a few (Vineis, 1999). That experience intersects most of the institutional formalization of representativeness, counterbalanced by the proliferation of decentralized institutions, such as neighborhood committees, by which the aim of the representativeness of universal citizens’ rights or the majority’s interests was simply withdrawn. Nowadays, the crisis of the institutions concerning where the rights of the majority should be enacted, such as town halls and neighborhood committees, goes beyond misinterpreting general values. Not only do institutions work inefficiently, despite referring to the same general values that the ordinary right emphasizes, but, most of all, such a crisis is counteracted by the paradoxical proliferation of spontaneous organizations that mobilize in support of or against very specific interests. Frequently, they are so localized that they oppose general interests. It is too simplistic to label these forces as not-in-my-back-yard syndrome. The position that local and particular interests are not legitimized as far as they defend particularism is not acceptable. They are well represented in this Ardeth issue by the inhabitants of Les Grottes. Whatever the difficulties, the way to provide them with institutional representativeness has been neither satisfying nor redemptive. Yet, it is evident that present institutional forms displace, disperse, and fragment the representativeness of such particularist interests out of the institutional architecture itself. Additionally, most likely, the roots of the crisis of urban policies can be found in this marginalization (Bobbio, 2002). A meaningful side note should be added. It was one of the characteristics of pre-modern social organizations to merge particularized and territorialized interests with representativeness, whereas modernity has rooted its premises in the ambition of universality. The reconceptualization of city is, thus, the unavoidable guest for all conversations regarding rights and design. It is the most complex expression of the common good, as noted above. The city’s nature is that of a neither entirely public nor only private good. Its very existence is related to the acknowledgement of its “common good” statute by those who are entitled to claim rights concerning it, either a citizen or a public official. “Common goods” are those that bond together citizens in a community. Some concern social goods, while others are more directly associated with space, such as squares and streets. In the context of the crisis of representativeness and, therefore, the crisis of decisions made “for the majority”, the problem is how limited representativeness and particularistic interests can reproduce the common goods that are needed for the city to live. Returning to the approach for which Ardeth is aiming, which concerns theorizing the measurement of the effects of decisions and design, how can design ignore welfare and imprisonment policies, as dealt with in this issue, as far as they may impact universal quality? The risk is to exclude substantial rights as well as an open conversation on values, which, more than critical theory or aesthetics, is indeed what legitimized the representativeness and authority of those in charge of design in the processes that transformed any action aimed at future results in the twentieth century. When dealing with authority, the design and law professions share the same sensitivity for once. Widespread populism expands from the extreme simplification of political representation to overrepresented slogans, increasingly found in the schools of architecture, such as the green city, the creative city, etc. They seem to mimic shared values; nevertheless, these slogans become practices and policies only by relying on know-how and the interests of designated competences and concerns that have never dialogued, thus, generating the city of new-corporativism (Secchi, 2013; Mazza, 2015). The illusion of territorial engineering is the expression of technocracy in command of social constructs. Among claims, “green”, for instance, is an exemplary good practice in Les Grottes. Green is equal to a park in Anglo-Saxon tradition, which does not fit most of the European cities’ histories. Above all, the opposition between “good nature” and “evil city” is too much of a simplification. Perhaps, alternatively, an idea of European urbanity should bet on the widespread presence of vegetation in neighborhoods, one that enhances the responsibility of active citizenship (Baudelet et al., 2008). It is not only a simplification of good and bad characters that marks the distance between competences and representativeness, which becomes a matter of attributing authority; the language itself and the tools that are applied to represent changes are also affected. In 1764, when the construction of the Sainte Genèvieve church was started in Paris (the church is now known as the Pantheon), the representatives of the majority and of documented competence, Soufflot and Perronet, decided that it was necessary to share with citizens the expectations of the result of the works. To do so, a famous painter, Robert, was given the task to visualize the pronaos of the church and its surroundings in a 1:1 model (Gabetti, Olmo, 1989). Imagery and scenery are crucial components for the preservation of the common goods value of the city. Imagery and scenery can legitimize or falsify as well. In this specific case, the representation of a future space is instrumental to exercise authority, and the production of urban imagery is necessarily the grounds for dialoguing between competences and the majority. Without this space for dialogue, it would be the corporative technical city that prevails with rights reduced to conformity to norms. The construction of the city, or rather of its buildings, has become too private an issue. The situation calls for an informed and non-instrumentalizable reflection on a much wider scale than it is possible to do here. Nonetheless, it is perhaps possible to trace a few fundamentals. The first node, again, refers to the valorization of the fixed capital intertwined with design, particularly large-scale design. The issue is bigger than the use of urbanization fees that expand services for citizens and, therefore, activate practices of citizenship-building. Indeed, city’s rights and their alienation are concerned. The issue is not new, and a primeval example of large-scale compensative equalization can be seen in 1754 Lisbon after the great earthquake and fire (Cardoso, 2006). The use of compensative equalization is precious, as long as it can be tailored to different contexts that are functional to territorial logistics of land consolidation. It is then a clear example of a technical tool that generates spatial imagery and landscapes. Without them, and without a complex notion of the social production of meanings that the city constructs, the compensative equalization strategy can easily be reduced to misleading particularism of a city’s representation as the sum of fragmented interests (it is not by chance that Cremaschi refers to Excavating Rights). In a strategy of sharing transformative scenarios as well as their timing and controversies, the compensative equalization re-establishes the principle of the city as a common good, given that common goods – building on localized spheres and boundaries (Torre, 2011) – have to deal with “connivance”. Further, the subtle intertwining of competence and “connivance” is precisely our second node. For those familiar with the historic European cities (Cutolo, Pace, 2016), it comes as self-evident that blocks and portions of the cities have been built by a connivance of developers, companies, and professionals. Connivance has to be intended in the meaning common among anthropologists, which is a close-knit, solid, and reciprocated relationship within a stable society (Gomarasca, 2009). What if the condition of stability changes, for example, in terms of the dimension of urban areas, to be made as a “city” during the urban expansion that followed WW2? What if the matter of knowledge and information becomes crucial without equal changes in the competence for urban decisions, as in the Trente Glorieuses? Knowledge is disruptive; it breaks down pre-existing certainties, transforms actors, and establishes new competitions among the stakeholders of urban transformations. In the knowledge society, some basic rules have to be respected, or populisms will find fertile ground to develop. Mainly, the players at stake should be acknowledged. The third node revolves around ordinary rights as the horizon to recombine transformative design as far as possible. With reference to the production of the city and the relationship between representativeness and the authority of urban design, whatever expression of representativeness is considered, not all decisions have to be subject to negotiation, which is likely the reason for the premature failure of urbanism. However, representativeness might proactively encourage the private sphere in redefining the extent and scope of its relationship with land. Practically, I argue for the conceptualization of a city of knowledge based on the neglected principles of connivance and ordinary law. In this way, a transformative action of design can truly be measured by the inducted effects, and it is enabled to shift its authority from a priori principles to its capacity of mobilizing and representing collective interests. This is a way that rejects emergency and pressing contingency even if it is quite the opposite of what is seen all over the world. A Community Land Trust is a non-profit corporation which makes possible and preserves the access to land as a resource for different kinds of needs and rights, from productive activities to housing. I argue the concept of property at the core of the CLT model is based on recognition as the reversal of exclusion: recognition of the subjects interested in the use of a given resource and hence concerned for its preservation. Recognition of their right and their capacity to take care of it and to govern it. Which role could have the project –at an urban and architectural scale- in making possible such a different approach to the ownership and the governance of resources? I will try to answer this question by referring to the CLT in Brussels, having contributed to the design process of one of their first projects. This article questions the link between public space and the physical features of it. The hypothesis is that in order to make effective the right to public space (borrowing the meaning of the locution from Henri Lefebvre), this latter should be dense of uses and users. The condition of density would spontaneously produce a social control on public space. Density depends upon the dimension and shape of the public space, as well as from its perceived aesthetic value. Hence, it is useful to reflect on the physical features of a public space, before urban political decisions on it are taken. For instance, not all streets are fit for becoming pedestrian: some might be too large, and hence after becoming pedestrian they could not support a critical plurality and density, and they would lose attractivity together with social control. The case study is the historical center of Turin. According to the author, architecture draws its primacy from being the foundation act of any human expression, the latter then becoming an interpretation of the former. The same concept of the human being, assumed as the carrier of any rational capacity, is not conceivable independently from a spatial relation with its living environment. In this essay, augments supporting the main thesis are deducted negatively, tracing back the most significant phases of the so-called “project of crisis” prompted by Modernity. This is described as a modality of thinking, which is completely de-territorialized. The main aim is therefore to show its aporias. Modernity, in order to free itself from the existing power relation system, assumes the “indeterminate” as its promised land to colonize and inhabit, thus performing a process of “heterogenesis of ends”. As a main consequence, architecture was doomed to become nothing more than a derivative of Planning, where the latter was assumed as the technical device to manage the anarchy of the former, as the paradoxical consequence of a rationality liberated from any form of spatial constraint. The crisis of this modality of thinking, accelerated by the financial capitalism’s failure, offers the chance to rescue back the original primacy of architecture, popping up a new possible epoch. In this article we want to argue about architecture response, in relatively recent times, to a problem that relates to international imprisoning jurisprudence which requires the reconciliation of conflicting terms. Architects have put forward proposals on prison for centuries (among others Palladio, Milizia and Alberti), but it is with the drafting of the European Convention for the Protection of Human Rights and fundamental freedoms that architecture has explicitly faced two opposing criteria, i.e. freedom and control. Since 1950, there has been an attempt to settle and harmonise the relationship between Art. 1 of the Universal Declaration of Human Rights, signed by the United Nations (OHCHR) two years earlier, inherent in the connaturality of human freedom and Art. 5 from the aforementioned European Convention which suggests terms of acceptability for prisons. A solution to this antinomy could be offered by architecture through the concepts of privacy and territoriality, considered by the Nelson Mandela Rules in 2015. The theme of total institutions can be reconsidered in terms of the relationship between architectural forms and the recognition or the denial of the rights of people who inhabit them. In particular, asylums – places where the power of reason has been exercised in order to create an architectural structure for people considered to be in some way outside or beyond reason – ask questions about architecture’s relationships with both power and reason, including its own power as an agent of discipline and the reason it projects onto its subjects. Intervening architecturally on these controversial pre-existences, means rethinking places whose history of use as asylums has ended – closed in the name of newly hard-won rights and of shifts in political thinking. Instead, these must become places which architecture opens up to the community as a guarantee of those acquired rights, as an example of a practice of a politics of space, of the past history of space and its possible future. Overlapping jurisdictions and supranational infrastructures generate an increasingly complex topology; the design, management and mapping of interactions is therefore a crucial task. Seiche is a platform that enables the definition and management of techno-legal procedures of information exchange between institutions that regulate such systems and the organisations that operate within. It acts as an interface between legal and data workflows, fostering system synchronisation and mapping dynamic networks of emergent sovereignties. The proposal is applied and tested in the form of a speculative narrative set in Khorgos, Kazakhstan; a logistic enclave between two infrastructural and political realities – the cornerstone of China’s Belt and Road Initiative. Within the debate around urban commons in Italy, it has been argued that the overlapping of public property and common use is needed in order to set a common. This article questions that perspective through the case of the masterplan for the Cavallerizza Real complex in Turin (2016), by considering space as a key factor in the understanding of a bundle of rights. The masterplan proposes the reorganisation of the right of use to establish a specific urban space as a common, through different tools acting in the fields of property regime, planning regulation and preservation regulation. In hisIl rovescio del diritto, Francesco Galgano, a master of civil law, played with the term “diritto” (law, right), pointing out that it was the only noun whose opposite does not exist. It is not an Italian peculiarity, because Recht, right, droit do not accept opposites as well and it is a serious matter. The law, in fact, as a complex of commands and norms whose disregard is punished, does not allow a “counter-right”. It is ontological substance: if the rules are serious, it is not given an opposite, negative substance. The right “is” in itself, and the rules can be respected or violated but the “non-norm” or the contrary of the norm cannot exist. It is true that law does not have the monopoly of rules (there are also more intimately strong rules, such as ethical and faith-based, and impassable rules, such as those of physics), yet it is true that it is the only one who has the power to make black out of white, unjust out of the just, false out of the true and when it does so, it contains within itself the contradiction and makes it its own. It is the right to be, when it wants, itself and the opposite of itself. This article conceives an urban project as a mechanism that traces rights on the ground. First, and most relevantly, a project separates public and private land and defines what can be built. At another level, design decisions involve a broad range of permissions and obligations. Thus, urban projects act as a form of regulation, like planning, albeit a specific form with its own rules and limits. The paper explores a two-step process. First, in the policy phase, some regulatory decision-making is delegated to design. Then, design challenges the value assumptions underlying decision-makers’ actions. ‘Regulation by design’ arranges material objects in space and activates those spatial mechanisms. This paper looks at the relationship between project and rights. At first, it discusses the redefinition of housing rights in the space of the city, by observing a workers’ district of Geneva, the neighborhood of Les Grottes, that was the object of struggles and occupations in the eighties. Today it is an eco-neighborhood like many in Europe, where the right to housing, forcefully demanded during the past urban struggles, has broken down into an ensemble of superimposed fragments. Pluralization of the right to housing refers to two different perspectives. The first originates from the influence of social analysis, according to which our current condition is an expression of neo-liberal policies. In this perspective, the broken down of rights is the other side of rights retraction of its modern form. The second refers to pragmatism and its democratic individualism. Here the multiplication of subjective rights, no longer hierarchical or competitive, is an expression of what each individual considers a right way of living. The project needs to be prepared to manage any gaps arising between these dimensions. This article presents the socio-economic stratification in Bogotá, Colombia, and discusses the socio-spatial elements of its constitution and development. The spatial classification of blocks and neighbourhoods based on services, amenities and building qualities in Bogotá, produces a surrogate spatialization of economic divisions. It maps, classifies and excludes but is also appropriated and contested as a hierarchical, sociocultural spatialization of residents. Taken up in the civic culture, strata has become a pattern of identification, stereotypes and discrimination that normatively striates the citizenship of Bogotanos identifying who should and should not go where.